A seriously injured man was found on the streets of Chevron Island this morning. 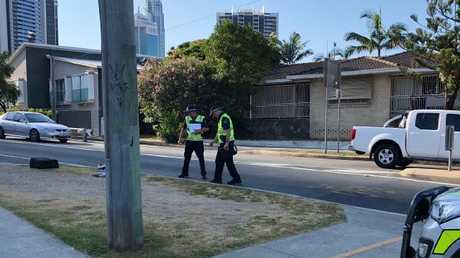 A man has been found on the footpath of a busy Chevron Island street with "a significant head injury" after being found this morning following what police to be a horror hit-and-run. Police have launched an investigation after a member of the public found an injured man lying near the intersection of Stanhill and Thomas Drives at 5am this morning. Police believe the incident may be a hit and run between a car and cyclist. It is understood the bike may be stuck underneath the offending car. Police at the scene of a Chevron Island incident. Picture: Amanda Robbemond. Tyre marks can be seen on the gutter and it is believed the victim may also have tyre marks on his body. Paramedic Greg Jones told the Gold Coast Bulletin: "The fella was lying in the gutter and there were marks on stomach like he'd been dragged," he said. "He had a head injury, he had a big whack on the back of the head. The man had two seizures with us, but his level of consciousness has recovered. Hopefully he'll be all right." A woman arrived on scene and picked up the travel luggage, but declined to comment on her relationship with the victim or incident. She picked up the bag with a pair of gloves and placed it into the trunk of her car. It is understood the luggage belonged to the victim, with the woman a member of the victim's family. 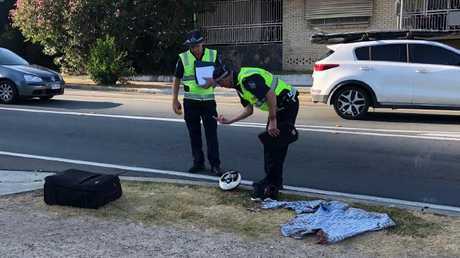 Forensic police are examining blood splatters on the road and items left along the roadside including a long sleeved shirt with blood stains, a travel suitcase, a helmet and lighter. The man was wearing a bicycle helmet according to information given to police by a witness, however, no bicycle was found at the scene. The site where the man was found. Picture: Amanda Robbemond. 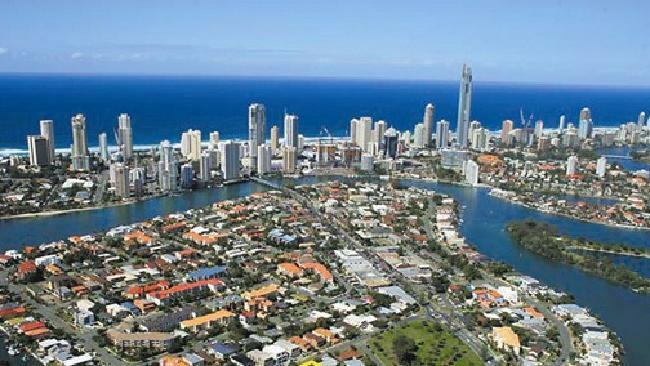 The man was taken to Gold Coast University Hospital with a significant head injury. Police have appealed to the public for any information about the incident or dash cam footage from Chevron Island during the early hours of today. 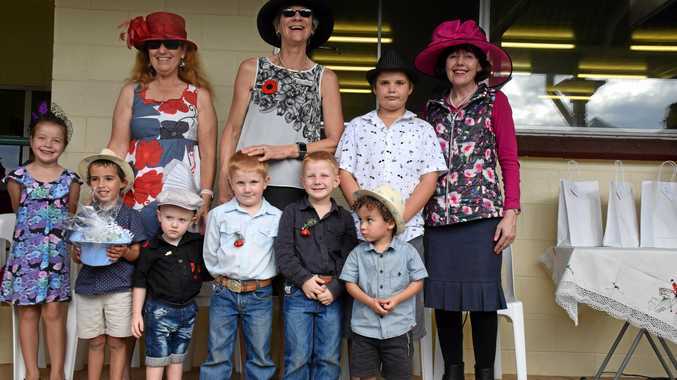 A Chevron Island resident said they had woken up around 4.30am to hear voices. "There was a man lying on the road," he said. "He was sort of in the gutter, he may have hit his head on the stormwater (drain). "We could see his legs moving. "Paramedics took his shoes off, he was well served by people there. There were about five ambulances. They got a board underneath him. The man was found at the intersection of Stanhill and Thomas drives. Picture: Amanda Robbemond. "I haven't seen so many police in all my life." Another resident said she wakes up at the slightest noise but didn't hear any crash or particular incident. "It's really unusual, I hear everything," she said. 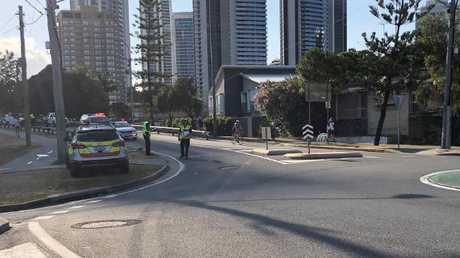 Police have blocked one lane of traffic into Surfers Paradise and are redirecting traffic.